Properties in Desmond Castle average 4.6 out of 5 stars. Kinsale, West Cork. Self-catering apartment - peaceful - easy walk to town. Property 29: Kinsale, West Cork. Self-catering apartment - peaceful - easy walk to town. House in the heart of Kinsale - superb views! Property 30: House in the heart of Kinsale - superb views! Absolute Peace And Sea Views In Rolling East Cork Countryside. Property 33: Absolute Peace And Sea Views In Rolling East Cork Countryside. Scilly, Kinsale, 3 Bed House With Spectacular Harbour Views - New! Property 47: Scilly, Kinsale, 3 Bed House With Spectacular Harbour Views - New! Wonderful host, stunning location &amp; a very nice house with everything you need for a delightful holiday. The house was very charming and roomy. It was clean and had everything you could need, and the views of Cobh were to die for. The house itself is also a local attraction being a part of the colorful deck of cards which makes the stay feel even more special. 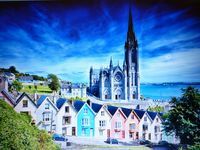 Perfectly located in downtown Cobh and less then a 10 min walk from the pubs restaurants and sights. Also only a 30 min drive from the Cork city center. We were greeted by Cathy&rsquo;s lovely mother in law Marion who we saw multiple times throughout our stay as we walked along the street. She was the sweetest woman we met on our entire trip and always asked us if we were enjoying ourselves or needed anything. The house has multiple bedrooms and bathrooms as well as a spacious living and kitchen area. Would be perfect for a big group or family, but was also perfect for just us too. Would 100% recommend staying here.